Happy Thursday! 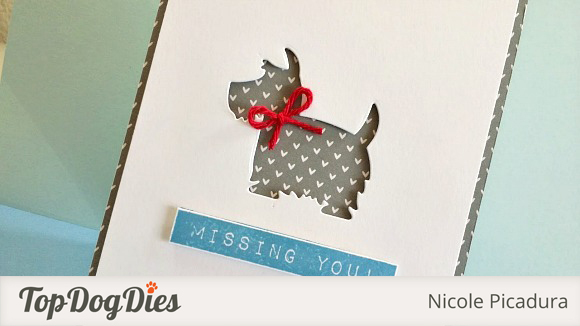 Today I am over at Top Dog Dies Blog to share couple of project featuring one of the new August release dies. Two cards were created using the Dog Days #2 die set and I am going to show you how you can use them in different ways to achieve CAS look. I especially love Dog Day Die Sets (TDD has #1 and #2) since they cover verity of sizes and you can do so much with them! 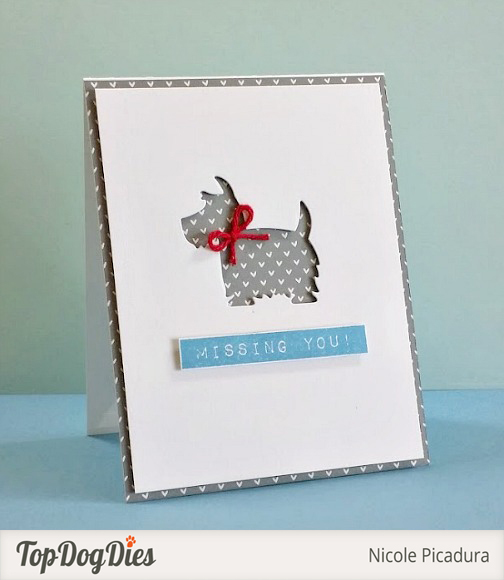 For the first card I am using this cute Schnauzer die from the Dog Days #2 die set. Lots of people usually pop out the die cut piece, but for this card, I decided to pop out the whole front layer of the card. I used a patterned paper with gray background and small white heart pattern and adhered it onto the card base. Next, I die cut the Schnauzer piece using a white cardstock and attached the negative piece onto the card base using some foam tapes. This is a great way to pop out a die cut image in a different way! For some more cuteness (since the dog is already so adorable!) I tied a small bow using some red baker’s twine and attached it to the dog’s neck. I think this is super cute! I stamped the sentiment, cut it out, and attached it to the card layer using some foam tape as well for more added dimensions. Super easy and fast! 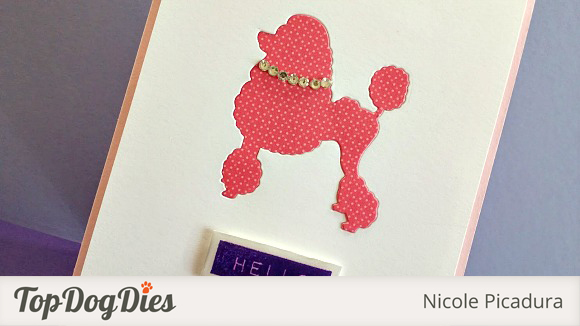 For the second card, I used this elegant, chic poodle die cut piece from the Dog Days #2 die set. Instead of using the die cut piece or the negative cutout piece alone, I decided to do an inlaid die cut technique. This is another great way to pop out the main die cut piece for the card. I used a very light pink cardstock as a card base and used white cardstock for the card layer. For this look, you will need to cut the die twice – one with the white cardstock layer and one with a patterned paper of your choice. 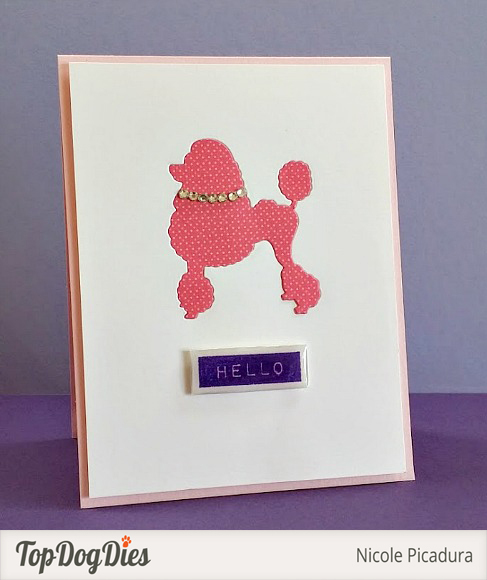 For this one, I used some pink with white polka dots patterned paper to match the card base’s color. All you need to do now is to put the card layer piece onto the cardstock first, and lay the patterned paper die cut piece right into the open area of the cardstock layer. They will fit perfectly – I used foam tapes for both pieces to create dimensions for the card. This technique is super fun and easy! To dress up our elegant poodle image, I added few small rhinestones around the neck area. This adds a very nice finished look to the card. For the sentiment, I stamped it and cut it out with some white margin around the sentiment. Then I attached it to the card using some more foam tape, and then I added more dimensions using Glossy Accent right on top of the sentiment. Once it dries, it gives this nice shine with some dimensions. Another great way to finish off CAS card! I hope you enjoyed today’s projects. Thank you so much for stopping by and have an awesome day!